I've had my fair share of illnesses in the three years I've been traveling -- from food poisoning to mono. It's unpleasant when it happens and it can be scary, especially if you're traveling alone. Here's what to do if you become sick while traveling. Travel insurance is so important and you shouldn't leave home without it. It's fine if you don't care about losing your possessions or missing a flight, but you absolutely need it for the medical cover. If you end up breaking your leg in the middle of the Mongolian countryside, you'll be looking at a bill that runs into the millions to get yourself airlifted by private jet to a hospital around the world. Give yourself peace of mind by purchasing travel insurance before you leave. It's rare not to experience a bout of travelers diarrhea when you're traveling at some point. You're dealing with unfamiliar water and food, and don't know where the sanitary places to eat are. You're being exposed to bacteria and diseases that you haven't built any immunity to and you're often traveling in more unsanitary countries than your home. Food poisoning happens to pretty much all travelers, and the best thing you can do is expect it. Pack some rehydration sachets and Imodium in your first aid kit so that you can help yourself if it hits and you can't leave your room. Carry a water bottle with you and keep it topped up so that you can stay hydrated. For any thing that doesn't seem serious -- headaches, nausea or cramps, for example -- take a few days off from travel to recover. Book yourself into a private room in a hostel or a fancy room in a hotel and treat yourself to a few days of relaxation. Watch your favorite movies, catch up with friends from home, take long naps and hot showers, meditate, do some yoga, read a book -- anything that will help you to feel better. If you experience symptoms that you've never had before, and they seem serious, it's time to head to the doctor. Symptoms include fever, persistent diarrhea or a bite from a wild animal. Visiting a doctor abroad isn't as scary as it sounds. Ask at your hostel and they'll be able to recommend an English speaking doctor or hospital you can visit. While you're there, you'll have to call your travel insurance company to make sure they'll cover the costs. If you're in a cheap part of the world you may find that your medical care won't be anything near as high as your insurance excess. You won't always be visiting big cities, so there will be times when you feel unwell but can't find a doctor or hospital in your town. If this happens, head for a pharmacy. Many of the pharmacists I've seen in countries around the world have been extremely knowledgeable and known exactly what my ailment was. 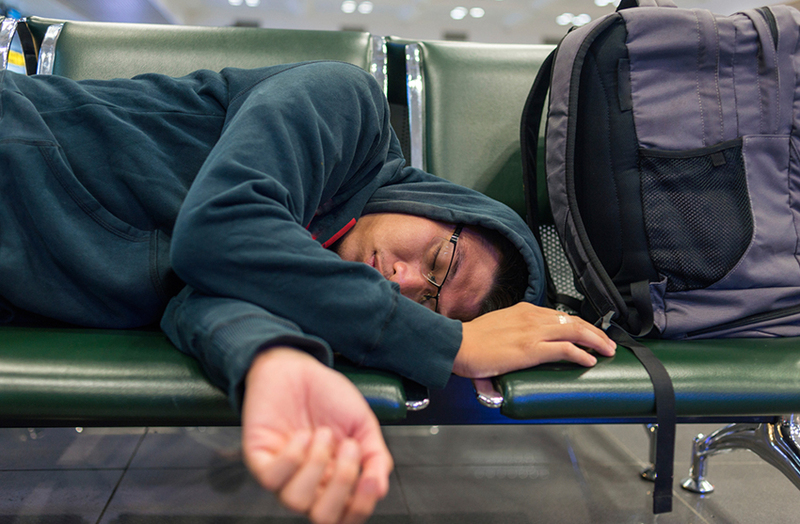 Getting sick while traveling can be a stressful experience but you don't need to worry. As long as you make sure to rest when you need to, and visit a doctor if it seems serious, you should be back on your feet in no time at all.